Floramite® SC Ornamental Miticide provides outstanding control of a variety of mite pests on ornamental plants in greenhouse, shade-houses, nursery, field, landscape and Interiorscapes settings. Floramite® SC is effective on a variety of mites and all life stages of Tetranychid spider mites. Floramite® SC produces quick knockdown through contact activity and long residual control of more than 28 days. Floramite® SC is easy on predacious mites and beneficial insects, making it ideal for use in IPM and resistance management programs. Mites Controlled: Bamboo Spider, Citrus Red, Clover, European Red, Lewis, Pacific, Southern, Red, Spruce Spider, Strawberry, Two SpottedFloramite® SC has a unique mode of action as a member of the Carbazates class of chemistry. 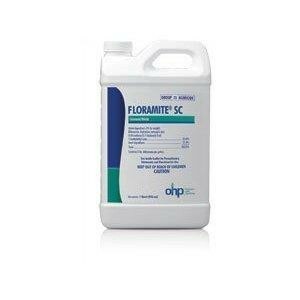 Floramite SC is a fast-acting, broad-spectrum miticide. Floramite SC is effective on a wide range of mites and all life stages of Tetranychid spider mites.